When will my order come? Hopefully, within the week after we receive your payment. We send everything first class, so it won’t be too long before the postman comes knocking! If for some reason, there will be a delay, we will let you know by email. We are only a very small team, so do bear with us. Can I sell Lydia’s things in my shop? Yes! Some shops are already stocking Lydia’s things alongside her books. Contact us to find out about Trade prices. Lydia’s catalogue is also available online, so you can see which products are currently on offer. Will Lydia sign my books? Lydia is happy to sign all books which are bought from the website. If you would like a bespoke signing, email your request and we shall do our best! 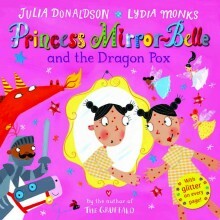 Please note that any Julia Donaldson books sold will only be signed by Lydia, unless stated otherwise. Can I buy Lydia’s artwork? Occasionally artwork and limited edition prints will become available. If you sign up for our newsletter, we can let you know when new things pop up! Email us and we will send you the current list of artwork which is available to buy. You can also follow Lydia on Twitter and Facebook to keep an eye on what’s new. I have written a story. Will Lydia illustrate it? It’s actually the publisher who tends to decide who is going to illustrate your story! You need to get a publisher on board first. 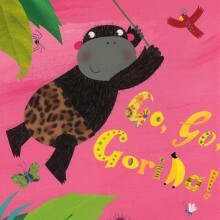 Lydia is kept very busy by Julia Donaldson, and there are lots of other lovely illustrators out there! Will Lydia donate a piece of artwork for my charity? Would Lydia come and visit our school? 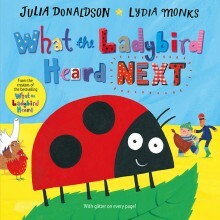 Where is the ladybird on the last page of What the Ladybird Heard? This is the question Lydia is asked the most! The first pages and the last pages of the book are called the endpapers. They are not really pages of the story. The ladybird is not in these pages, or if she is, she is too small to see! You can find her on every page of the story. And on one page, you might see that she has another ladybird friend! Can you spot the page that has two ladybirds?! Who puts the glitter on the books?